In Thomas Hart Benton’s painting “Going West,” a train pulled by a coal-black engine hurtles into a wash of golden light trailing a ribbon of billowing smoke. Utility poles edging the tracks fall back as though pushed aside by the rushing train. 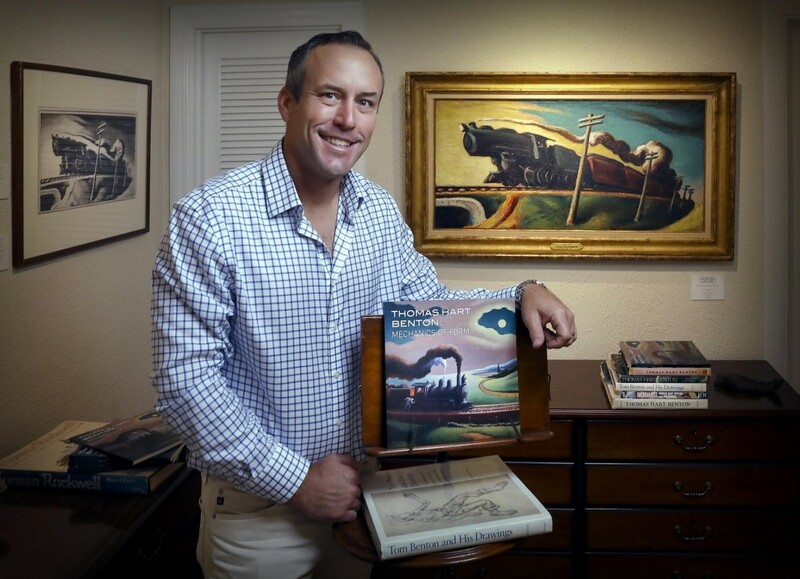 The 1926 painting is the centerpiece of “Thomas Hart Benton: Mechanics of Form” at Surovek Gallery in Palm Beach. The show features more than 65 works in oil, watercolor, tempera and other media spanning the artist’s career. Most have been shown only rarely or are being exhibited publicly for the first time. The majority are on loan from the Thomas Hart and Rita Benton Trust and other private collections. But several, including “Going West,” are for sale. 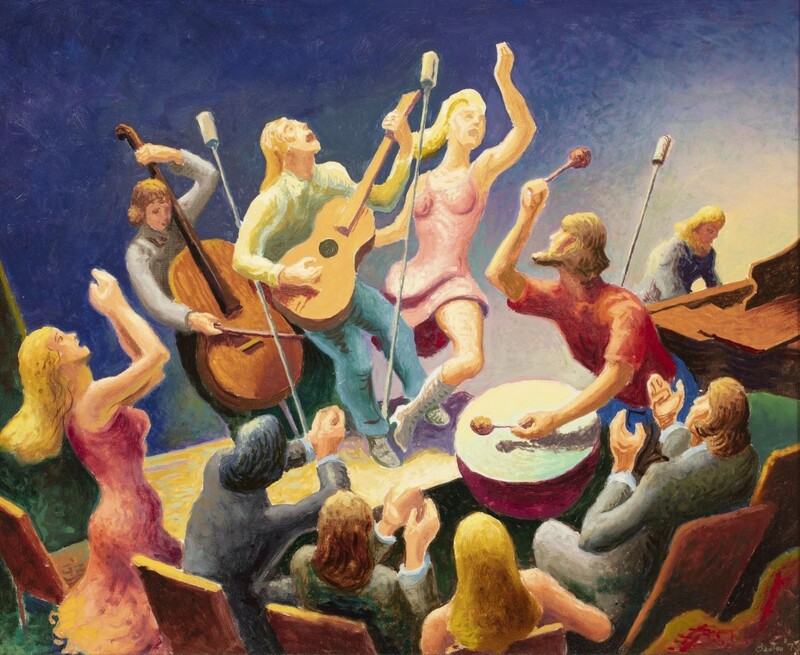 The exhibition follows a 2017 show at Surovek Gallery highlighting the regionalist paintings for which Benton is best known. Benton, who lived from 1889 to 1975, became famous in the inter-war period of the 20th century for his distinctive, vigorous, curvy and colorful murals and paintings depicting the people of the American heartland. His most acclaimed work, the mural series “America Today,” commissioned in 1930 for the New School of Social Research in New York, resides in the collection of the Metropolitan Museum of Art.  The success of Surovek’s earlier show, and the availability of “Going West,” triggered this show, said director-owner Clay Surovek, son of gallery founder John Surovek. Clay Surovek and New York-based Lester-Thompson Fine Art collaborated on the exhibition. Where: Surovek Gallery, 8 Via Parigi, 349 Worth Ave.
Before its recent re-emergence, “Going West” had been exhibited only twice since its creation — in a 1927 gallery show and in 1980 when it was auctioned at Christie’s. In Benton’s hands, the train “becomes a living thing, the embodiment of life, force, energy and the American spirit,” Adams wrote in a letter to Surovek. This exhibition also differs from the earlier show in that it’s the first to focus on the abstract foundation of Benton’s work, which, far from being abandoned when he adopted his everyman regionalist style in the 1920s, continued to be an important tool throughout his career. As a teacher, he passed on his notions of organizing a painting to his pupils, including abstract expressionist trailblazer Jackson Pollock. 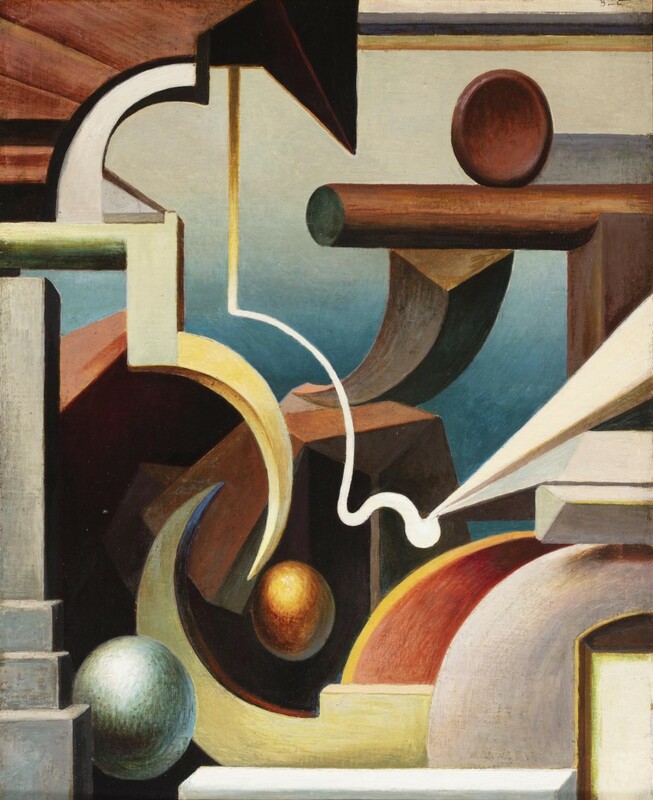 The show takes its name from Benton’s 1920s essay “The Mechanics of Form Organization in Painting,” in which he lays out his principles of composition, form and aesthetic organization. Crayon sketches from the 1920s in the show diagram these ideas using descriptive phrases and abstract shapes. Benton even reduced old master paintings to such basics. Many people aren’t familiar with Benton’s early abstract modernist paintings, and even if they are assume he abandoned abstraction when he discovered his groove, Surovek said. “This show covers a 60-year span and shows how when you put his modernist work next to his regionalist work you can see how it’s related,” he said. 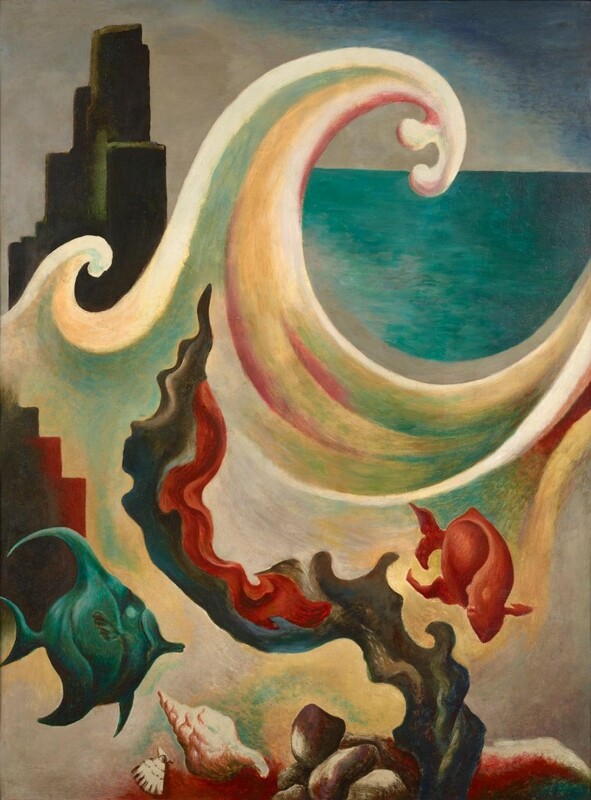 Accordingly, viewers might see in the sickles, balls and hazy blue horizon of the 1919 abstract painting “Rhythmic Construction” the waves, fish and ocean of “Sea Phantasy I,” a panel from Benton’s first mural commission. The murals, executed around 1925, decorated the sports den of avid fisherman Albert Briggs. Many painters of Benton’s period have fallen from favor, Surovek said. Benton and Edward Hopper “are among the few still sought after,” he said. “There’s not been a dip. Actually, there’s been an uptick.” The dozen or so works in the show for sale range in value up to $5.5 million.